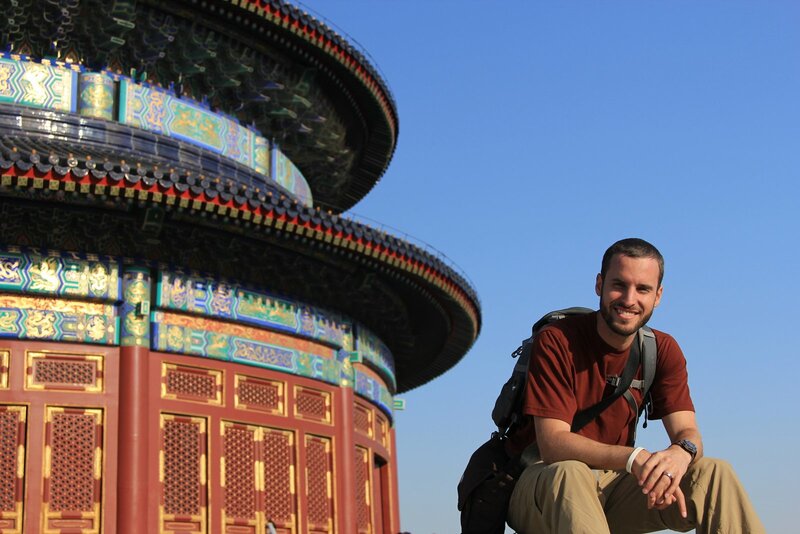 The Forbidden City is a place I’ve wanted to go ever since I was a kid. The day finally arrived and it did not disappoint. We were blessed with good weather. In Beijing that means all the pollution is blown somewhere else (like California). It also means the sky was blue. Go figure. We woke up at 4:30 am to make our way to see the 6:00 am flag raising ceremony. There was goose-stepping under the huge portrait of Mao. Satisfied, we sought out a Starbucks, naturally, waiting the Forbidden City opened. There used to be one inside, but someone in the Chinese government finally realized the irony and had it removed. Entering with hordes of tourists was reassuring. Had we been alone and there for an audience with the emperor, believed to be divine, it would have been intimidating beyond imagination. I’m quite convinced they had that in mind when they drew up the plans and decided to call it “The Forbidden City”. It was a long, but gratifying day wandering through the enormous complex. Guided by a GPS activated audio guide that we wanted to kill by the end of the day, we learned about its impressive history, perused it’s ancient clocks, and ogled at the Emperor and Empress’s jewelry — including a golden ear pick. The tour has a healthy dose of “foreign tampering messed up China” a sentiment repeated at most tourist sites and a feeling that still feels pretty pervasive today. It also covered a fair amount of Imperial drama including concubines being locked up by jealous wives and later thrown in wells. Fortunately, the price of admission is no longer death — we paid 100 yuan each.